To start off, let's quote Telepathy's fantastic biography: "We're a band, we make records and play shows. Contact us." To be a bit more specific: Telepathy is a quartet from England that plays instrumental sludge with a black metal edge. The record is titled '12 areas' and it's released on CD and Vinyl (Devouter Records), tape (Tartarus records) and as a digital download through their bandcamp page. I have no idea about the shows but from what I hear on the album, those must be furious and epic, because the music is simply crushing. 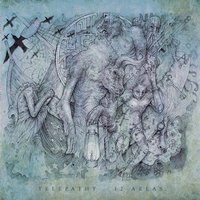 Contrary to most sludge-bands, Telepathy doesn't have vocals. Remembering the 'sludge problem' we mentioned in a previous review, that is a huge plus. The music can definately stand on its own, mostly because of its wide variety of influences. It's mainly sludge, mixed with a little post-rock, doom metal and math rock. There's tiny bit of ambient and some blast beats here and there. Yet, the most striking element is the fact that Telepathy seem to hate repetition. Apart from the short tracks, most of the tracks have an enormous variation in riffs, making the songs continuously shift in tempo, heavyness, riffing and so on. No ten seconds on this album sound alike. In some aspect you can ask if they didn't put too much variation in 12 Areas - maybe they could have saved some riffs for new tracks. But then again, I think this band can invent millions of riffs and song structures. complicated song structures start falling into place. Apart from the two intros 'Hypnos' and 'Deluge' all tracks are very heavy pieces of music. It's almost like listening to Eyehategod, Monkey3 and Kayo Dot at the same time and still being able to headbang yourself into a long-lasting coma. There's a lot of energy and a lot of instrument-abuse, often even to the extent of making feel me sorry for the drum-kit. It seems that no cymbal, no tom and no snare were left unharmed in the making of this record. Basically, that's what this music is all about; expressing fear and anger. The lack of vocals on 12 Areas makes the album a bit better than most sludge albums. It forces the band into creating four to almost eight minute lasting tracks where lots of stuff is going on. If I have to choose a favourite on this one, it will probably be 'To Kiss The Ocean's Floor'. It's a bit less chaotic that the others and sometimes has an Opeth feel to it. But the other tracks are in no way inferior. The use of calm, post-rock like passages that sometimes suddenly and sometimes 'on the sly' evolve into powerful distorted eruptions are well capable of keeping the listener in their grasp and focused on trying to survive this assault.